This is vintage Christopher Moore and his Pine Cove “series”. Certainly not for the young or snowflakes, but humorous none the less. 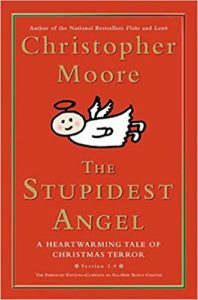 I’ve never been disappointed by one of Moore’s novels. Freaked out yes, bored no! This article was published on Feb 10, 2019 . It is tagged christopher moore, pine cove, The Stupidest Angel. You can follow any responses to this article through the comment RSS feed.